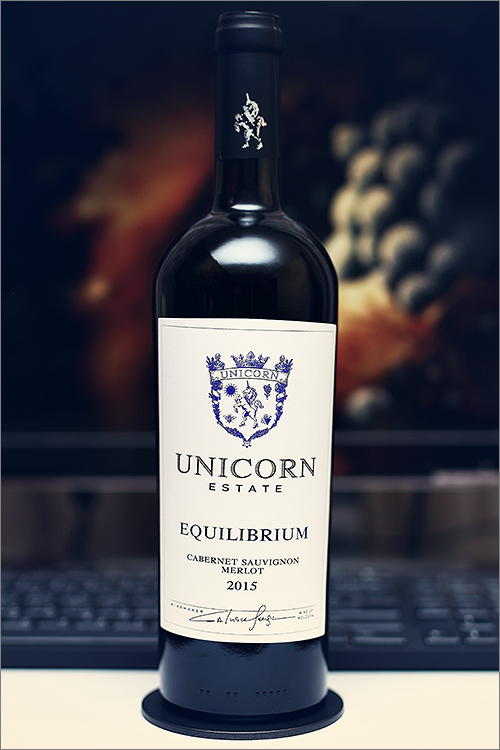 Tonight we are going to review a wine that is relatively new on the local market – Equilibrium Cabernet Sauvignon – Merlot 2015 by Unicorn Estate. This is a classic Bordeaux-style blend, made of cabernet sauvignon and merlot grape varieties and is part of the winemaker’s ‘Equilibrium’ wine line. The wine has been aged for 6 months in french oak barrels and, as is the trend lately, it was produced in a limited edition of only 4000 bottles, but let’s not put too much emphasis on the theory side. Without further ado, let’s get straight to the tasting and find out how good this wine really is! Hazy ruby color with pale copper shades towards the rim of the glass. The nose is strong, filled mostly with red fruits and spice flavours: sour cherry, oakwood, cranberry, red plum, red currant, wolfberry, dried red cherry, dried cranberry, red mulberry, red apple and beetroot. An instant later the nose is filled with notes of red pepper, paprika, cloves and some nuanced hints of allspice. The wine is dry, with high alcohol level, high acidity and firm tannin. It feels wide, opulent and lean, with a nuanced fruity-supple accent. This is a quite tart, light and quite appealing wine, as it tastes crisp and a bit off its balance, with overwhelming acidity on the mouthfeel. The wine has a fair overall balance, yet it lacks character and firmness. It has a medium finish and a balanced, tart and lean aftertaste. This is definitely a good Wine of Moldova and the overall rating says the same, with 89.9 points scored it is right there, among the best wines we’ve tasted so far. Please click on the chart icon on the left in order to get to the wine rating page, where you can find all the wines we’ve tasted to date. Conclusion: this is a quite young and opulent wine blend that is still on the rise, as it requires a couple more years of bottle ageing (2 to 3 years should be enough) before it will reach the summit of its prime form. Overall the wine feels lean and wide at the moment, as it tastes light and tart, lacking some character – a bit more tannic grip on the mouthfeel would be desired in order to strengthen the wine’s structure. This is why we would recommend to counter-balance all the acidity in the wine with slightly sweet meaty dishes that are rich in natural fat, like for example a grilled porterhouse steak with tomatoes and scallions or an authentic greek moussaka. Cheers!